We've been living and breathing Nutcracker these past few weeks and months. My daughter performs the part of a Party Girl and a Mirliton in our local Nutcracker production this December. My son plays a smaller role, but he's super cute nonetheless as a Tiny Tot in the party scene. They've both spent a lot of time both back stage, below stage and on stage during rehearsals. Now that the performances have started, we've been spending even more quality time at the theater. Participating in the Nutcracker production has provided both of my kids with a valuable opportunity to witness first hand all that goes on behind the scenes during a live performance. 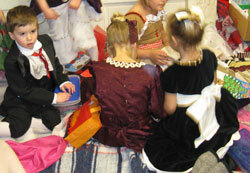 Most audience members remain blissfully unaware of the hustle and bustle of activity back stage. Make-up and hair, costumes, props and set, lighting, warm-up - the magic begins long before the curtain opens. As I was researching Nutcracker themed children's books, I came across a wonderful picture book title by Rachel Isadora that provides a unique look at the Nutcracker ballet from a performer's point of view. Lili on Stage follows a young girl named Lili as she gets ready to perform as a party girl in Act I of a Nutcracker production. She and her friends warm-up, put on their make-up and costumes and wait in the wings until finally they walk on stage and join the fabulous party scene, watching as Drosselmeyer gives the gift of a nutcracker. Off stage, as she heads back to the changing room, Lili sees all the dancers who will perform in Act II - Marzipan, Dew Drop, the Sugar Plum Fairy, and more - dressed and ready to dance. Isadora beautifully captures all the preparation, awe and excitement a young dancer experiences when getting ready to perform in a ballet production. Her lovely watercolor illustrations suit the theme particularly well, realistically and expressively illustrating the dancers. Both boy and girl dancers are portrayed, and Isadora also shows racial diversity of the cast in her depiction of the performers. Isadora herself was a professional dancer before she began a career in children's books. Her first-hand knowledge of ballet and the dancer's life is evident in every single page of this book. Ballet instructors may want to read the story aloud to students before a performance because the book offers plenty of helpful advice for performers: no speaking on stage, hold your head high, don't eat or drink while in costume. 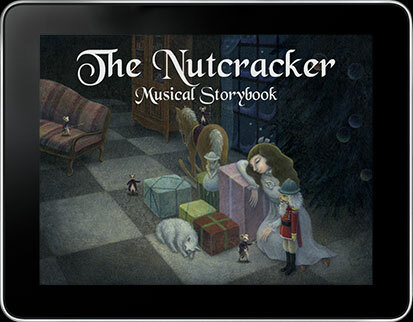 Isadora provides readers with a short summary of the Nutcracker story in the beginning of the book. My daughter loves this book because it shows all of the different character dancers in Act II of the Nutcracker ballet. She performs as a Mirliton (a.k.a. Marzipan or Shepardess) during the Dance of the Reed Flutes, and surprisingly we've had a hard time finding this particular piece depicted in Nutcracker children's books. 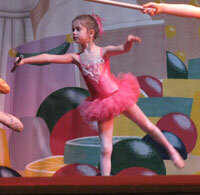 Luckily, Isadora included the divertissements, although she uses some different terms for the characters than we are used to -- the Russian (Trepak) I believe is depicted as Candycane?! 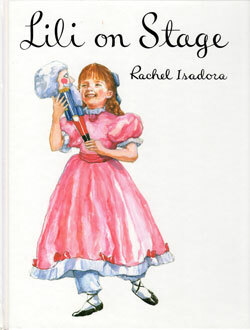 Lili on Stage is part of Isadora's "Lili" series, a picture book series perfectly suited for young ballerinas. The book is currently out-of-print, but can be found at a reasonable cost used. Other books in the series include: Lili at Ballet and Lili Backstage .